Shakespeare’s original Romeo et Juliette has inspired endless number of variations by writers, composers and so many other walks of arts. Yet, Charles Gounod and his libretto writer Jules Barbier have opted to remain as loyal to the original play as possible, with only one notable exception to which we will return later on. Even the prologue–overture presents an outline of the drama (a spoiler, in today’s television language) as in Shakespeare’s play. The opera will celebrate its 150th anniversary in April 2017 but it is performed by the Israeli Opera for the first time, following an original production of the Monte Carlo Opera. And it was a very worthy premiere indeed. Act I was somewhat hesitant, not hinting yet to the greater pleasures to arrive. As if it took the cast some time to warm up, the ladies section of the chorus was not perfectly in line and even Aurelia Florian (Juliette) appeared like putting too much pressure on her beautiful voice. Even the Ah! Je Veux Vivre (I want to live) aria–waltz, the better known one of this opera, did not get too much reaction from the audience. On the other hand, Noah Briger as Capulet and Na’ama Goldman as Stephano have already began to shine. 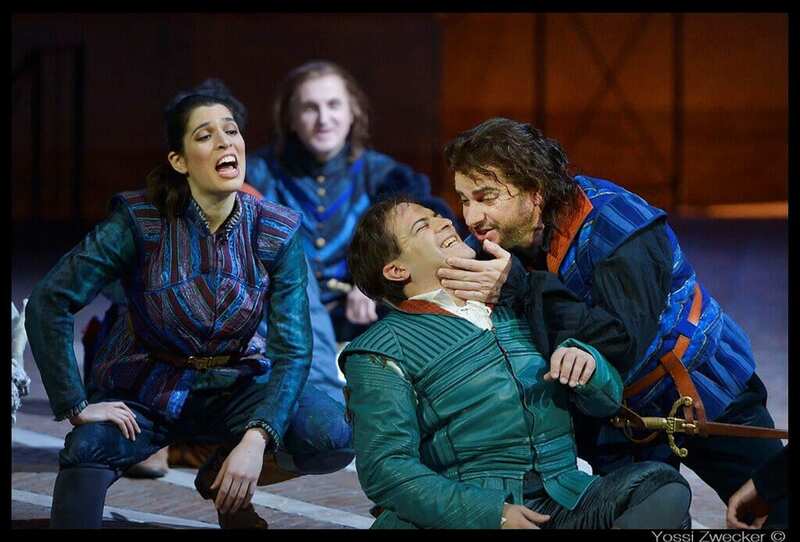 Above all, throughout the night, was the tenor Gaston Rivero as Romeo. I have not heard him before and was deeply impressed by his voice, stage presence and perfect fit to the role. It brought to mind early days of great tenors such as Roberto Alagna or Jose Carreras. The bass Petri Lindroos was also very convincing as Father Laurence. In Act II the entire cast was at its best, including a much better performance by Florian. 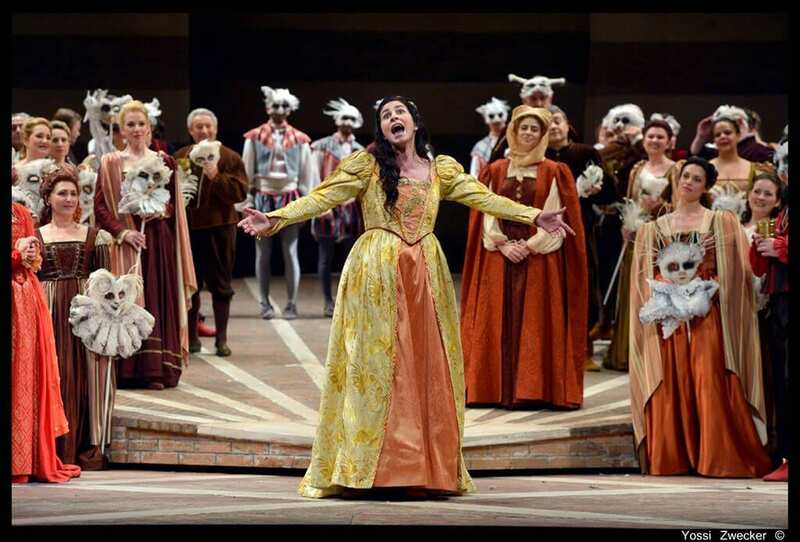 Act III exposed excellent singing from Shay Bloch as Gertrude and in the opening of Scene ii the audience was blessed with an unexpected show stopper: Romeo’s page, Stephano, comes looking for his master and mocks the Capulets in an unforgettable performance by Na’ama Goldman. 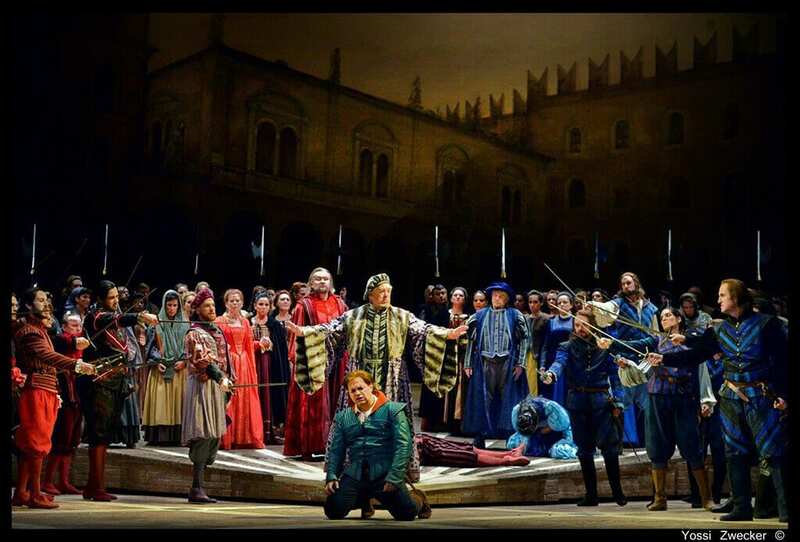 Following were the tragic events when both Tybalt (Yosef Aridan) and Mercutio (Enrico Maria Marabelli) are stabbed to death. Acts IV and V highlighted the high quality of Rivero and Florian as Romeo and Juliette. The duet of the lark announcing the dawn is heart breaking. 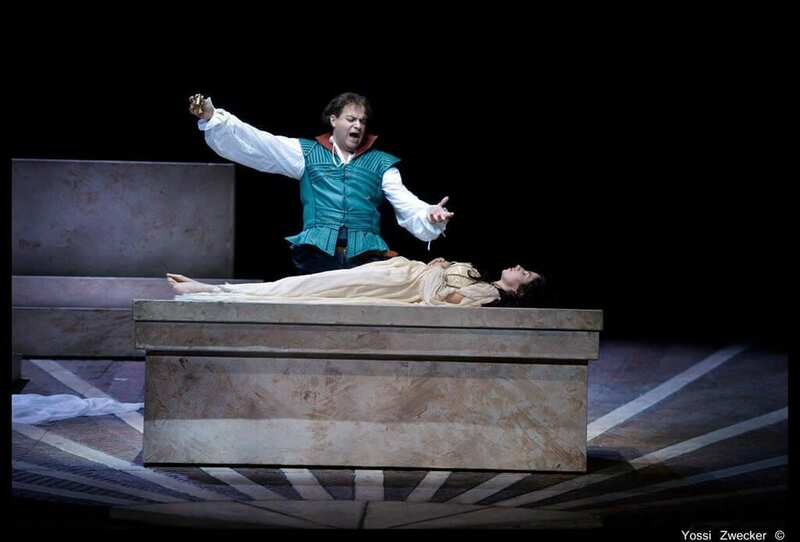 Act V presents the meaningful deviation of the opera from the original play: Juliette wakes up from the influence of the potion while Romeo is still alive, after consuming his deadly one. Their duet dying in the arms of each other is a masterpiece. One remains to wonder why this opera, with such beautiful music by Gounod, is so rarely performed. In any event, this is a production not to be missed.